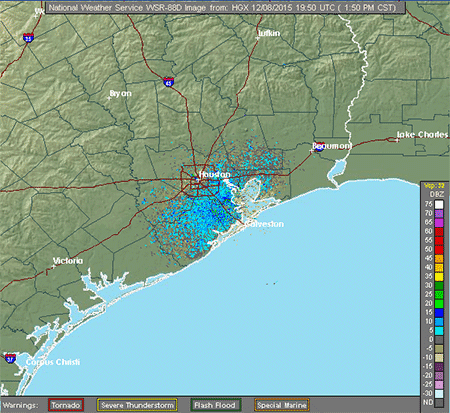 The radar continuously scans the atmosphere by completing volume coverage patterns (VCP). A VCP consists of the radar making multiple 360° scans of the atmosphere, sampling a set of increasing elevation angles. There are two main operating states of the Doppler radar; Clear Air Mode and Precipitation Mode. Within these two operating states there are several VCPs the NWS forecasters can utilize to help analyze the atmosphere around the radar. These different VCPs have varying numbers of elevation tilts and rotation speeds of the radar itself. Each VCP therefore can provide a different perspective of the atmosphere. The scanning begins with 0.5° elevation meaning the centerline the radar beam antenna is angled 0.5° above the ground. Since the the beam itself is 1° wide, it returns information about what it "sees" between 0° and 1° above the horizon. After it completes all 360° sweeps at the 0.5° angle of elevation the radar is tilted to the next elevation angle in that particular VCP. This process repeats until all elevation angles have been completed after which the Doppler radar processes the received information and produces the radar images you commonly see. A word of caution concerning Doppler radar images (and this is true whether the images come from the National Weather Service or a local television station radar). The Doppler radar images are what HAS happened, NOT what IS happening. Because it takes time (from several seconds to a few minutes) to make the image available via the Internet, or updated on your local mobile device, by the time you see it, it is already "old". It provides you a picture of what was happening not what will happen in the next 2-5 minutes. Do not delay in seeking shelter should you see inclement weather approaching your location. Typical path of the radar beam in clear air mode (VCP 31 & 32). There are two basic operating modes of the Doppler radar: a "clear-air" mode (i.e no precipitation) and a "precipitation" mode. Typical radar image during Clear Air Mode. The blue colors around the radar site is due to ground clutter and dirt, bugs, etc. in VCP 32. Clear Air mode is used when there is no rain within the range of the radar. In this mode, the radar is in its most sensitive operation state. This mode has the slowest antenna rotation rate which permits the radar to sample a given volume of the atmosphere longer. This increased sampling improves the radar's sensitivity and ability to detect smaller objects in the atmosphere than in precipitation mode. A typical radar image in clear air mode will not reveal much. Generally, the only returned energy to the radar will be very close to the radar's location. A lot of what is seen will be airborne dust, bugs, and particulate matter (image at right). However, snow does not reflect energy sent from the radar very well. So clear air mode will occasionally be used for the detection of light snow as well. Also, this mode is helpful in detecting discontinuities in the air mass, such as a frontal boundary, and in monitoring the onset of precipitation. There are three clear-air mode VCPs; 31, 32 and 35. VCPs 31 and 32 complete a volume scan using five elevation angles in about 10 minutes. In this clear-air mode the radar makes two 360° scans of the atmosphere at the lower elevation angles. During the first scan at each elevation the radar is in surveillance mode and is looking for objects. During the second sweep the radar is determining the velocity of the wind. In the remaining higher elevation angles, the radar conducts both surveillance and velocity operations together. VCP 31 and 32 elevation angles are the same for each. The difference between the two is the "pulse" mode. VCP 31 uses a "long pulse" mode meaning the time the radar is transmitting each pulse is 4.7x10-6 seconds. This is repeated 314 times a second (the PRF is at its lowest). Therefore, the wavelength is the much longer in this mode increasing the radar's sensitivity. But this comes at a cost which is a decrease in the range of the winds velocity radar can determine. VCP 32 has a higher PRF (more pulses per second) so it is not quite as sensitive as VCP 31 but it can now detect a wider range of the wind velocity. For this reason, most NWS Doppler radars will be in VCP 32 during the Clear Air Mode. Despite the "clear-air" nomenclature, this mode is used with light precipitation. The slow scan rate has been most helpful especially with depicting snow. VCP 35 scan elevation angles. VCP 35 adds additional overlapping low elevation angles to further help depict all types of light to moderate precipitation events as well as non-precipitation returns. Operating a little fast than the other two clear-air VCP's, VCP 35 completes a volume scan in about 7 minutes. When precipitation is occurring, the radar does not need to be as sensitive as in clear air mode as rain provides plenty of returning signals. At the same time, meteorologists want to see higher up in the atmosphere when precipitation is occurring to analyze the vertical structure of any storms. This is when the meteorologists switch the radar to precipitation mode. Currently, there are three main precipitation mode VCPs. VCP 12 has 14 elevations slices and performs 17 360° scans in a very fast 4 minutes 6 seconds. It is used primarily for severe weather as it is best at sampling the vertical structure of storm clouds located close to the radar. This mode provides updates at a quick pace as well as the ability to see high into the atmosphere. The traditional method in radar scans was to increase the elevation by one degree increments for examining a storm's vertical profile. Today, the increase in elevation in the lower levels is less than one degrees meaning the radar beam coverage overlaps. This provides a denser vertical sampling at lower elevation angles which means better vertical definition of storms, improved detection capability of radars impacted by terrain blockage, better rainfall and snowfall estimates, and resulting in more storms being identified, in addition to the quicker update cycle. Similar in elevation scans and angles, VCP 12 is also a fast updating radar mode but is best for more distant severe weather. Complete volume scans occur each 4½ minutes. VCP 12 & 212 elevations angles. This is the general surveillance VCP when in precipitation mode. It offers very good low level coverage and the most upper-level vertical sampling of the atmosphere of any VCP. A full volume scan occurs about every six minutes. This VCP is typically used for tropical systems. While vertical resolution is lacking it scans the lower levels multiple times and in different PRF's. The result is to greatly enhance velocity data. A complete volume scan occurs about every six minutes. There are occasions when the radar image is updated quicker than would otherwise occur in all VCP's other than 31, 32 and 121. Called SAILS (Supplemental Adaptive Intra-Volume Low-Level Scan) the NWS meteorologist has the ability to insert up to three additional 0.5° elevation scans during the course of one volume scan. While this increases the overall time for a complete volume scan to be accomplished these additional lowest elevation scans allow for much faster updates of ongoing weather near the surface. Therefore, these updates can occur as often as each 1½ minutes with the additional 0.5° scans inserted verses over four minutes between updates using the VCP as is. From these three core precipitation VCP's, there are a few VCP's to handle different aspects the radar's limitations. Velocity aliasing is the inability of the radar to determine wind velocity and problems caused by "second trip echoes". The radar can operate with different pulse durations (the length of time between pulses) called "pulse repetition frequency" or PRF. If the PRF is low (longer time between transmission of pulses) the signal can travel farther to the more distant objects. However, the ability to determine velocity is greatly reduced. High PRF's (more rapid pulses meaning less listening time between pulses) greatly improve the radar's ability to determine velocity. Yet, it also increases the number of second or third trip echoes. What this means is the radar transmits a new pulse while the previous pulse has yet had enough time to return to the radar from distant object. This tradeoff between distance and velocity is known as the Doppler dilemma. These other VCP's have been developed (spin the radar faster and/or vary the PRF) to help reduce velocity aliasing.